We’re finally back in the game! After last week’s bizarro universe episode and the whole “where is Huck?” ordeal, we’re finally getting back to the question raised in the very first episode of the season––who is going to be president? It felt like the show finally knew what to do with Jake. He’s way better when he’s cleaning up bodies and breaking into kitchens like a ninja than he is as Olivia’s love interest or a political schemer. Turns out he’s a real ride-or-die Vice President. I absolutely believe Mellie should be president, but I also don’t care which one of them becomes president. I’m just happy we finally have an answer so the show can move forward. 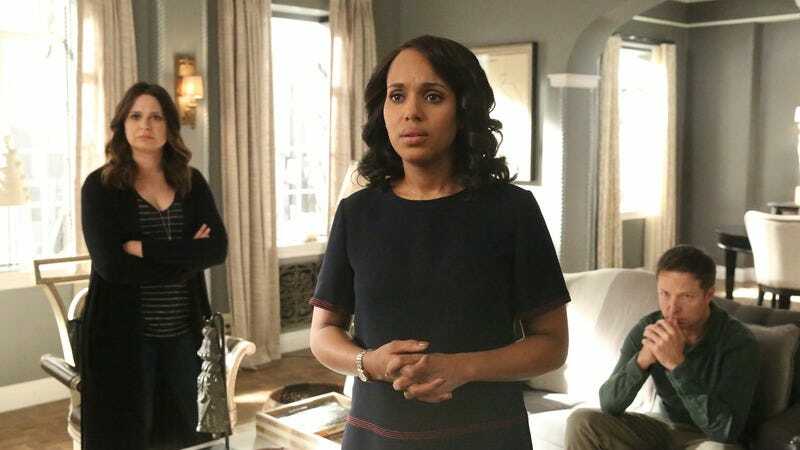 I was never convinced that Cyrus or Mellie had the intelligence, spark or charm to be president, but Cyrus isn’t even electable in Scandal’s bizarro world. I almost forgot the last time we really saw present day Cyrus was in his weird prison murder fight episode. That episode still feels unnecessary. Well, goodbye, Liz. The writers only brought you back when the plot called for it and this time the plot demanded a dead body. The last time we saw you, you were trying to help Cyrus. Now, you’re suddenly aligned with the shadow government and rooting for Mellie. Rest easy knowing you weren’t the worst person David Rosen ever slept with. Fitz is still seeing the FBI Director. Also, Fitz is a horrible boyfriend. Can you imagine a presidential candidate’s ex getting on TV and telling people not to vote for them because they were a bad husband? The scene with Vargas’ widow worked. The scene with Michael did not work. Cyrus’ speech was moving. I almost thought it would work, but…murder. Olivia’s plot to get herself arrested so Cyrus could win was so dumb. That was never going to work. No one was going to let that happen. Also…Eli did kill people, so maybe it’s ok if he goes to jail? Oh great, Olitz is back.